Schoolcraft Community Schools has 8-12 Schoolcraft or "Power" standards per grade level. 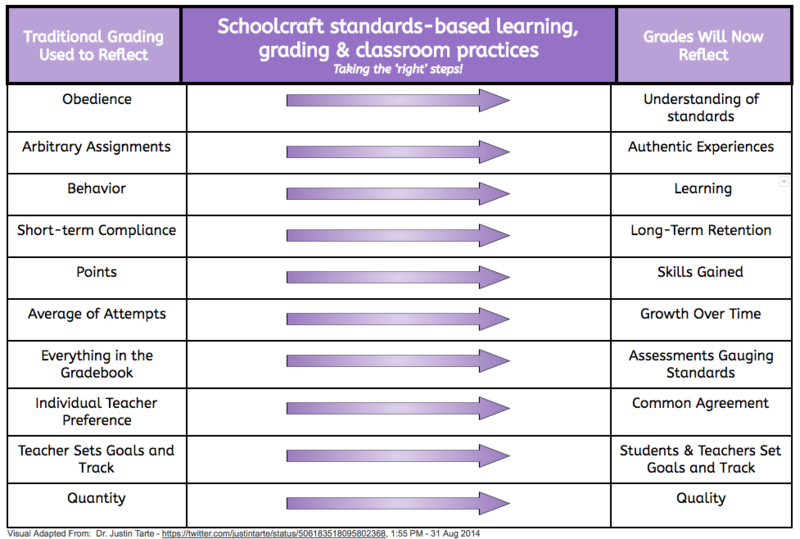 These standards represent the skills and knowledge students need to be successful in that grade level and beyond. Each Schoolcraft standard has a Proficiency Scale or rubric which describes what it takes to be 'basic/2/C' versus what it means to be at a 'great/4/A' level. Questions about links below? Please contact Ric Seager, Curriculum Director or Matt McCullough, Teaching and Learning Innovator. 1. Schoolcraft Community Schools was ranked the #1 Middle AND High School in Kalamazoo County per the 2018 Michigan Department of Education School Index Ranking. 2. Beginning in the Fall of 2018 all Math and ELA classes are standards-based in teaching, learning and assessment methods (with Science and Social Studies soon to follow). Each class has approximately 10 standards which need to be met. Achievement is leveled and is assessed/gauged via a proficiency scale for each standard. 3. Schoolcraft Community Schools was awarded a substantial pilot grant from the Michigan Department of Education to explore Competency-Based Education models beginning in the Fall of 2018. We believe all students can learn the higher order thinking skills needed to be successful in the 21st Century. Want to read more? CLICK HERE for the complete roadmap! Would you like to learn more about how Schoolcraft students are learning via relationships and projects with our community? CLICK HERE to head to our Strategic Partnerships for Authentic Learning site!